Celia Lovsky (born Cäcilia Josefina Lvovsky, February 21, 1897 – October 12, 1979) was an Austrian-American actress. She was born in Vienna, daughter of Břetislav Lvovsky (1857–1910), a minor Czech opera composer. She studied theater, dance, and languages at the Austrian Royal Academy of Arts and Music. Lovsky married journalist Heinrich Vinzenz Nowak in 1919. By 1925, they were apparently estranged and she was romantically involved with playwright Arthur Schnitzler. She later moved to Berlin, where she acted in the surrealist plays Dream Theater and Dream Play by Karl Kraus. There, in 1929, she met Peter Lorre, who had seen her in a production of Shakespeare's Othello near Vienna. The couple traveled to Paris, London, and the United States. Lovsky was instrumental in bringing Lorre to the attention of Fritz Lang, leading eventually to Lorre's appearance in the film M (1931) directed by Lang. They lived together for five years before their marriage, and stayed married until 1945, remaining close friends for the rest of Lorre's life. After the couple settled in Santa Monica, California, Lorre had not wished Lovsky to work, believing he should be the breadwinner and she should remain at home. For the rest of Lorre's life, she was his publicist, manager, secretary, financial planner, nurse and confidant. However, after their divorce, she started taking roles in American movies and television. She made a name for herself playing slightly exotic roles such as the deaf-mute mother of Lon Chaney in Man of a Thousand Faces (1957) with James Cagney and Apache Princess Saba in the Jane Russell film Foxfire (1955). 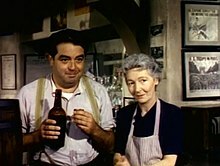 As she grew older, she was given dignified dowager roles, such as a Spanish matriarch in an episode of Bonanza titled "The Spanish Grant" (1960), Romany matriarchs, elderly Native American women such as in the Wagon Train episode "A Man Called Horse", expatriate Russian princesses, and a brief but memorable role as the widowed mother of Reinhard Schwimmer, one of the victims in the film The St. Valentine's Day Massacre (1967). Her final movie appearance was of the "Exchange Leader" in Soylent Green (1973). She delivers the final confirmation to Edward G. Robinson's character Sol about Soylent Green's true ingredient. She also appeared in the Twilight Zone episode "Queen of the Nile" (1964) as the elderly daughter of a never-aging actress (played by Ann Blyth). One of her other TV roles was as the Vulcan matriarch T'Pau in the Star Trek episode "Amok Time" (1967) who officiates at the aborted wedding of Mister Spock. ^ Youngkin 2005, p. 496. ^ Celia Lovsky biodata on Petition for Naturalization as Cacilia Josefina Lowenstein, ancestry.com; accessed October 7, 2015. ^ a b c Youngkin 2005, p. 32. ^ Youngkin 2005, p. 39. ^ Youngkin 2005, p. 37. ^ Youngkin 2005, p. 87. Youngkin, Stephen D. (2005). The Lost One: A Life of Peter Lorre. University Press of Kentucky. ISBN 0-8131-3700-4. This page was last edited on 15 March 2019, at 19:27 (UTC).